Percy Main produced a clinical all round display to beat Benwell & Walbottle by 64 runs to make it three wins in a row for the men from St John’s Terrace. Andrew Green, acting as captain for the day, lost the toss and was asked to bat first. Openers David Anderson and Anthony Hornby got them off to a great start as they added 83 for the first wicket in 20 overs before Hornby was out lbw to Stephen Reed for 37. Hornby faced 70 balls and hit six fours. Anderson departed three overs later for a well compiled 47 when he was caught at cover by Fenwick Frisken off the bowling of Hassan Raza, who finished with 4-41. Anderson hit six fours in his 48 ball innings and his dismissal left Percy Main 97-2. Barry Stewart batting at four was dismissed for a three-ball duck, although he was a little unfortunate as the bowler took a great reaction catch diving forward to take the ball off a well struck drive. Green and Will Taylor looked to rebuild the innings and took the score to 120-3 before a rush of wickets threatened to have them all out for 150. Taylor was bowled for 19 by Raza. Philip Cramman hit a return catch to Samir Haque to be out for three. Green departed for 15, edging a ball from Haque through to wicket keeper Adam Richardson, and Michael Boyd was lbw to Raza for a duck to leave Percy Main perilously poised on 142-7. Amit Sunda and Andy Beer looked to counter attack. Sunda hit his third ball for four and looked to score runs quickly. He played an array of drives, pulls and a reverse sweep as he scored on both sides of the wicket before departing for a run a ball 27. At 168-8 in the 43rd over, Beer looked to shepherd the tail and take the Percy Main score towards 200. He took a lot more of the strike and went for his shots, including the shot of the innings as he launched Stephen Reed over long on for six. Consecutive boundaries to end the 44th over took the score 185-8. Barry Errington was dismissed for four with the score at 190, leaving last man Mark Armstrong to support Beer. The pair added a priceless 25 runs in the last five overs as Percy Main closed on 215-9 from their 50 overs. 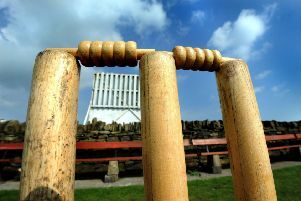 Armstrong scored an unbeaten run a ball 16, which included two fantastic drives through the offside and a pull through mid-wicket, all of which went for four. Beer finished 34 not out from 34 balls. His innings contained two fours one six, and his counter attacking innings was mainly responsible for taking Main past 200. Having set Benwell & Walbottle 216 to win, Percy Main got off to the dream start as Green took four wickets inside the opening 14 overs, reducing the opposition to 37-4. Green had Greame Robbie caught behind by wicket keeper Hornby for eight, then beat Michael Birrell for pace as he spooned an attempted pull shot straight up in the air for a caught and bowled for nine. Beer then took an outstanding catch in the gully from a thick outside edge to dismiss Frisken for a duck before Green clean bowled Singh for 11. Green would finish with 4-24 from his eight-over spell. Stewart offered great support in bowling tightly in his opening seven overs, finishing with 0-22. After 15 overs with Benwell & Walbottle 46-4, Green introduced Sunda and Armstrong into the attack. Sunda bowled with control and allowed Armstrong to try and take wickets at the other end. The move paid dividends as Armstrong took a wicket in his second over, trapping Stephen Reed lbw for six, then six overs later he then removed Richardson for six, David Anderson talking a good catch at mid-off to leave Benwell & Walbottle reeling at 70-6. Haque helped Raza add 22 for the seventh wicket before Haque became Armstrong’s third victim of the innings, padding up to a quicker ball to be out lbw for ten. Armstrong would finish with 3-49 from ten overs. At 92-7 in the 31st over, Raza had scored 40 of the 92 runs on the scoreboard. Having realised that he would have to score runs quickly to get anywhere near the 216 run target, Raza began to monopolise the strike and went after the bowling. He hit Armstrong for consecutive sixes on his way to bringing up a 77-ball half century. Raza then hit Anderson for consecutive boundaries as he took the score to 119 in the 36th over. Raza pushed Michael Boyd through the leg side and looked to run two to retain the strike. Sunda running in from the boundary picked up the ball and threw down the stumps at the bowler’s end. The resulting direct hit meant that Cary Robson was run out for a 14-ball duck. Boyd then picked up his first wicket in his next over as he clean bowled Craig Brown through the gate for a duck. At 130-9 the result appeared to be a foregone conclusion. The only question that remained with Raza 74 not out was would he reach his century. He manoeuvred the ball well, piercing the gaps in the field, and accelerated to 91 from just 110 balls. But he then tried to loft Boyd over the infield but did not strike the shot well enough and Cramman at mid-off took a well judged catch. Raza’s dismissal meant that Benwell & Walbottle were all out for 151 giving Percy Main victory by 64 runs. They now go into their clash at Tynedale on Saturday in good spirits.